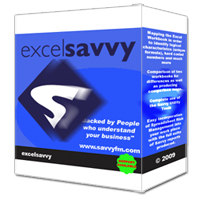 ExcelSavvy is the most powerful, flexible and user friendly spreadsheet analysis software currently available. Remember spreadsheet errors are so pervasive and costly to business, that by investing in excelSavvy you will achieve payback in minutes! Mapping the Excel Workbook in order to identify logical characteristcs (unique formula), hard coded numbers and much more. Comparison of two workbooks for differences as well as producing comparison maps. Complete use of the Savvy Utility Tools. Easy incorporation of Spreadsheet Risk Management into your work place with the full suite of Savvy reports produced. Easy installation and ExcelSavvy's user friendly (point and click) rich functionality will mean that you will immediately be able to use the tool productively to reduce the risks involved in relying on or developing spreadsheet models. "Backed by People who understand your business"
By working with us, you work with a team who are not only experts in technology, but who have a detailed understanding of financial modelling with Excel. We share your sense of urgency and are committed to delivering a product that will exceed your expectations. We can only be satisfied in what we do if every one of our customers gives us the highest marks for our product, as well as for our service and support. This is proven by our ever growing community of satisfied customers.